As you sail along the coast of Cape Cod for your event, you are creating an unforgettable experience for your clients and employees with a summer evening out on the water. Let beautiful Cape Cod become the backdrop of your next corporate event with corporate sailing charters on the Liberte. As you sail along the coast of Cape Cod for your event, you are creating an unforgettable experience for your clients and employees with a summer evening out on the water. If you are looking for a unique venue to host your next corporate party, consider these reasons to take your event to the water on the Liberte. Unlike the restrictive setting of restaurant seating, your guests can mingle and talk freely throughout your sail. With plenty of room to sit, snack, and have great conversations in an elegant yet casual atmosphere, the guests of your corporate event will be comfortable to enjoy their evening on the water as a memorable experience with your company. Corporate events in the summer are great opportunities to get outside and enjoy the beautiful weather with your friends and coworkers. Why host your corporate event indoors when you could be out on the bay? Make the most of the season by enjoying this summer activity on the water! Sailing is also an excellent opportunity to show out-of-town clients all that the Chesapeake has to offer in the summer months. Not only is sailing aboard the Liberte a beautiful way to spend a summer evening, but it is also a unique and memorable experience for team building with your company. Create new memories with some of our customized team building programs in which you can utilize sailing as a new and memorable way to your bond with your team. A fun evening out on the water for corporate team building is a great way to bring your team together this summer. 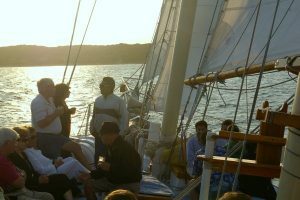 Enjoy Your Corporate Event in Cape Cod with a Sailing Party on the Liberté! This entry was posted on Friday, June 1st, 2018 at 9:34 am. Both comments and pings are currently closed.